Salads are a great starter to any meal and most are easy to make and are a great source of vitamins. Sugar snap pea shoots have a delicate light flavor and texture that your ordinary greens don’t have. Sugar snap peas germinate quickly, which will allow you to create this salad within weeks of planting the seeds. If the pea shoots are ready during the week use them! Don’t wait for the weekend to create this spectacular salad that is very easy to make. Teach your children how to cut the newly sprouted pea shoots and they will enjoy it too allowing you to concentrate on the rest of your meal. If you want another version of a pea shoot salad try our recipe Sugar Snap Pea Shoots and Grape Tomato Salad Tossed with Lemon Infused Olive Oil. Ingredient amounts will serve four. Heat the first two tablespoons of sesame oil over medium high heat and sauté mushrooms until tender and they begin to brown. Add 1 tablespoon of soy sauce and sesame seeds, sauté for another minute to blend flavors and reduce sauce. Remove mushrooms and place them in a small dish and refrigerate to cool about 15 minutes. 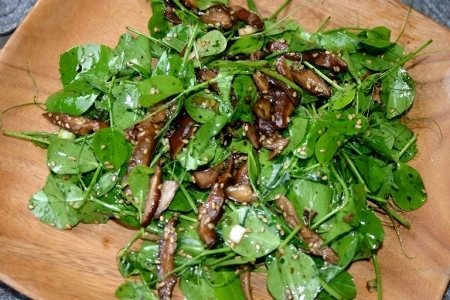 Rinse and drain pea shoots, place in a large bowl, toss with mushrooms, soy sauce and sesame oil.